Their spherical nature means Sphelar solar cells can be moulded into any shape. The Sphelar, which is the brainchild of Kyoto-based Kyosemi, is a perfectly round solar cell that can be made as small as 1mm in diameter. 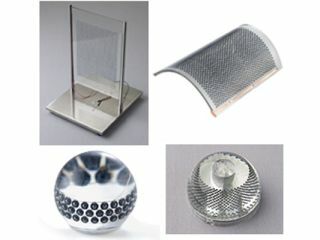 In combination, hundreds or thousands of the devices can be used to form a solar panel of any shape. While it may not seem like a major difference, the practical effect of making a non-flat solar panel is that it doesn't have to precisely face the sun to capture energy. In fact, Sphelar cells can generate electricity from both direct and indirect sunshine; effectively soaking up available light whatever direction it comes from. Construction methods are also efficient - less silicon is needed to make a Sphelar than a conventional solar cell as the spheres are crystallised out of molten silicon by gravity during a free fall from 14m. Standard cell manufacturing results in half as much silicon being wasted as is actually used. Perhaps the most flexible aspect of the new cells is their ability to be moulded into any shape needed and placed in any location. Possibilities include solar panels in awkward places or even windows that generate electricity through Sphelar cells embedded in the glass.